Christmas: the countdown is on! Please consider the opening lines of this blog as a deterrent to any Scrooges, Grinch-like misers or Oogie-Boogie men – it’s going to be all about the most wonderful time of the year! Right . . . now that we’re all on the same, holly-bordered page, it’s time to set the sleigh skis in motion to ensure a relaxing yuletide with your loved ones. October is nearly a full three months away from Christmas, but each Christmas, how many times do you have to resign yourself to it all just not being done? We’re not recommending you turn into a festive machine to reproduce a home Christmas reminiscent of a Good Housekeeping magazine cover, but there’s so much you can do in advance to reduce stress and enable you to get more of the things you enjoy done. Here are some suggestions for the things you can start now to allow for a more memorable Christmas. 32% of people worry every year that they will be unable to save for Christmas, with 17% claiming they’ll need to borrow money in order to help them fund it. This absolutely is not what Christmas is all about. Manage your expectations and that of your family by working out what you can afford well in advance, and how you’re going to fund it. If you do nothing else, devise a budget. Avoid resorting to using your credit card by preparing homemade gifts in advance, setting up Secret Santa exchanges (with a reasonable spending limit!) and doing research on potential sales. For example, now that the kids are back in school, many retailers are trying to shift stationary stock with brilliant promotions. These make for excellent stocking fillers! Also bear in mind that if you’re trying to scale back spending, friends and family may not always be on side straight away. Being steadfast in your decision may ruffle feathers, but by doing it early, the dust will be settled come Christmas! Right now, you have time to prioritise what you actually want to do. Did you miss a ‘breakfast with Santa’ event last year, or not get chance to take a train journey with mince pies? Plenty of events are being announced on tourism websites and into Facebook groups. Many are popular, so get tickets before they sell out. If your have friends that aren’t in town very often, get a date in the diary before they commit to further social engagements! However, just because you’ve got ample planning time, make sure you don’t overcommit yourself; Christmas is a time to relax after all. Creating a list of everyone you need to buy for in advance reduces the likelihood of forgetting someone, and if you’ve made list with them in mind, you may find that you’ll be more inclined to spot something that they like if they’re in the back of your mind! Similarly with Christmas cards, make a list, and contact friends via social media to get new addresses if you suspect they’ve moved house. Have you ever considered making some handmade gifts? At this stage, it needn’t be a wistful “wish I’d done this . . .” because you still have time. Gifts with the personal touch can really bring some magic to Christmas. It can be a really enjoyable process and can save you money. From bath scrubs to scarves, candles to personalised stationery, Pinterest has some wonderful ideas to get the creative eggnog flowing. Crafting materials will also be in greatest supply and more likely on sale now. Save the best until last, shall we? Food is to many, the most important aspect of seasonal proceedings, and there’s plenty to be prepped in advance so that you can relax. Christmas cakes can also be frozen for up to one year so you could happily make one as early as you like and freeze it. For optimum freshness, wrap the cake tightly in a double layer of greaseproof paper, followed by a double layer of foil and store in a cool, dry place in an airtight container. Don’t wrap the cake directly in foil as the fruit in the cake can react with the foil. Feed the cake occasionally by brushing it with your spirit or liqueur to keep it fresh. Baked mince pies can be frozen for up to three months. Once you’ve cooked mince pies, allow them to call and place into resealable boxes, putting a sheet of greaseproof paper in between any layers. At Christmas, just warm them in an oven for three or four minutes. If you love Christmas cookies but will be too busy to commit to the flurry of flour and clean-up whilst trying to keep the house clean for guests, you can prepare cookie dough or gingerbread dough in advance and freeze this. When you’re ready for a sweet treat, get the dough out to defrost, cut into cute shapes, bake, and have fun decorating! 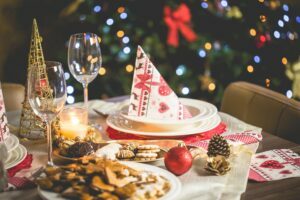 There are plenty of ways you can get ready for Christmas to have a stress-free and special time with your family that we haven’t listed here. Even if you can’t bear the thought of popping on your elf’s hat just yet, give some thought to what you may get a jump on to avoid any hassle later!